Welcome upon arrival at the Leh airport (3,500 mt) and transfer to hotel. Rest of the day fee for accalamatisation. Morning after breakfast proceed to visit Sankar monastery, Peace Pagoda and Changspa Chorten. which is situated on the valley floor. Afternoon free at leisure. Overnight stay at the hotel. Morning after breakfast drive 50 kms to visit the famous Hemis Monastery. Later drive back to Stakna. Upon arrival meet the Rafting team who will give you instructions on Rafting and safety. Raft along smooth river to reach Thiksey. Enroute stop at Stakna bridge and have Lunch. Afternoon Raft again and stop at Thiksey. Overnight stay in tents. After an early breakfast drive to visit Thiksey Monastery. Later drive 2 kms further to visit Shey Palace . Drive back to camp and start Rafting to reach Spituk. Lunch enroute. Checkin at the camps in Spituk for overnight stay. Morning after an early breakfast proceed to visit Spituk Monastery situated at the end of the Leh airport. Later drive back to the Rafting camp and start the final part of the Rafting till Nimu. 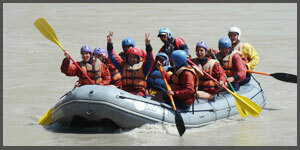 Rafting will finish after the confluence of River Zanskar and Indus at Nimu. Later proceed for a short village visit to Nimu. Overnight stay at the Camp. Morning after breakfast proceed to visit the Likir Monastery which has an impressive sitting statue of Maitreya Buddha. On the way back visit Basgo Monastery. Later drive back to Leh and on arrival checkin at the hotel for overnight stay. Morning after breakfast transfer to airport to board flight for Delhi.